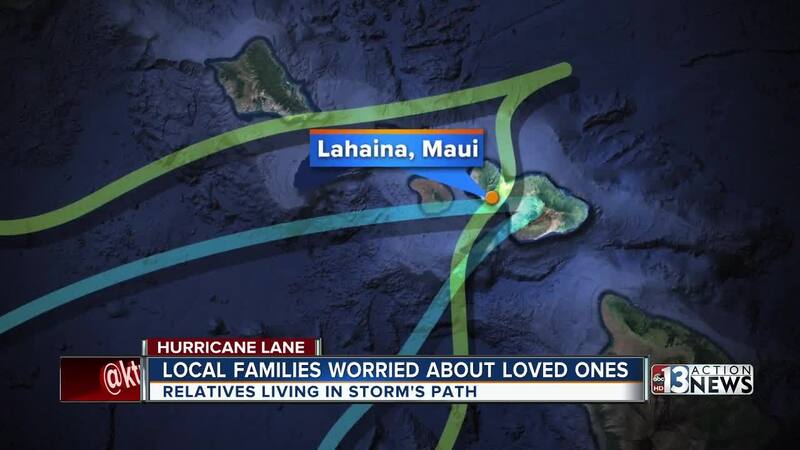 Many people here in Las Vegas are full of worry talking to family members who are living in Hurricane Lane's path in Hawaii. From her Las Vegas home, Alexy Rollins FaceTimes with her parents and her brother in their home in Lahaina, Maui. "Did Daddy board up the windows or anything or board up the truck?" she asked in the FaceTime call. "We did not do the windows but where we used to live, they did the windows cause they are closer to the ocean," said her mother Teri Haidl. Terry and Marc Haidl spent the day preparing for the major hurricane. They stocked up on food, water, and supples. They also helped their neighbors put away furniture. "It's really gray," said her father Marc Haidl as he showed us the sky during the FaceTime call. "That's where it's gonna come from." The family is nervous but remaining calm. "Once they said it was a Category 4 and they said it was really strong and it actually was a hurricane, my mom started to get really nervous and then I started to get kind of nervous," said Rollins. "Cause she's actually there. I'm not there." The mother and daughter both agree, they're most worried about not being able to talk once the power goes out. "The major concerns now are running out of resources, not being able to be in contact, the damage that could happen to the house," said Rollins.